One truly can experience the most luxe joys of life when visiting San Francisco as a guest at the Galleria Park Hotel, a Joie de Vivre property, situated between San Francisco’s Financial District and Union Square—just minutes from some of fashion’s most exclusive ateliers and the historic Chinatown. An architectural landmark, the Galleria Park Hotel boasts of a rich history of its own with 177 residential-style rooms and suites, a tranquil, pet-friendly park terrace, and more. A multimillion-dollar renovation and redesign was completed in early 2018 and drew inspiration from the property’s storied past, preserving timeless architectural features, while embracing modern aesthetics that enhance the guest experience. Even if you only have a weekend to venture west, you may soon find yourself leaving your heart in San Francisco. Legend has it that the Martini was originally created on the grounds of Galleria Park Hotel in the 1860s, prior to the earthquake and fire, when the property was the Occidental Hotel. An itinerant miner asked the bartender—Jerry Thomas—to create something special for him. The miner mentioned he was on his way to Martinez, California. So Thomas created the “Martinez,” which later became known as the “Martini.” The Galleria Park Hotel has incorporated this bit of history into their boutique hotel offerings by hosting a daily Martini hour in an intimate corner of their lobby daily at 5:30 p.m.
Bespoke experiences for guests of the Galleria Park Hotel are at the core of being a Joie de Vivre Hotel, part of the Two Roads Hospitality brand, with in-room fitness kits, a morning coffee and tea service, a gym pass to a 24-hour on-site fitness center, and more, the property is also pet-friendly. For $75, guests with pets receive a pet bed, bowls for food and water, and tasty Beastro Bones and a Let’s Pawty treat baggie provided by Paw Patch Pastries, a San Francisco dog “barkery” that specializes in organic and naturally gourmet dog treats. It’s a Joie de Vivre belief that their hotels embrace the neighborhoods they occupy. 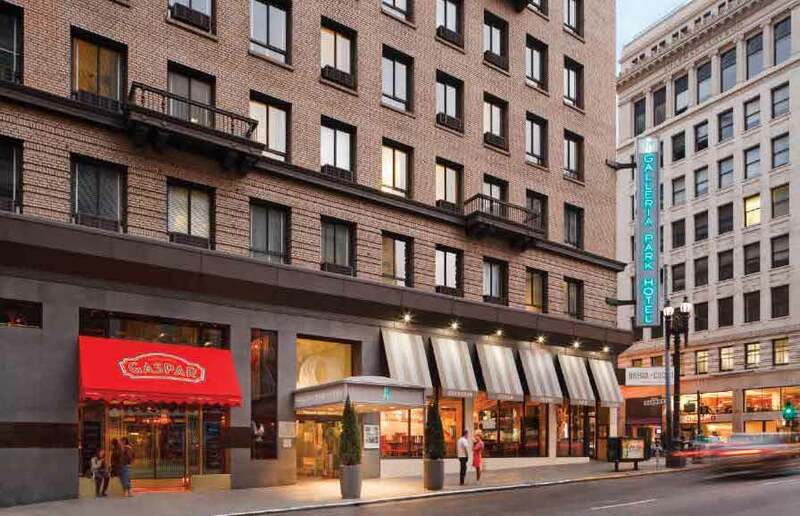 To this end, historian Rick Evans leads one of San Francisco’s most respected architectural walking tours, which meets in the lobby of the Galleria Park Hotel. This walk takes you to the city’s hidden public spaces and forgotten treasures to show you why today’s San Francisco looks and feels like nowhere else, and ends with a sneak peek at the massive developments that will make tomorrow’s San Francisco even more unique. A basic tour lasts about 80 minutes, but once you realize how close you are to a number of San Francisco’s most notable landmarks, you won’t want your tour to end. After a quick stop at a Blue Bottle Cafe for an oat milk latte (a luxury to someone from the Midwest), or a pastry from Manresa Bread, available in Verve Coffee Roasters—Head Baker/Partner, Avery Ruzicka’s concept as conceived in the kitchen of David Kinch’s 3-Michelin star Manresa–is a trip to The Embarcadero, located on San Francisco’s waterfront, that has become a bustling area of shops, businesses, and sightseeing attractions. A favorite among the locals and tourists alike is La Mar Cebicheria Peruana, a charming tribute to one of the cornerstones of Peruvian cuisine, cebiche, and the environment created to enjoy it—the cebichería. Under world-renowned Chef Gastón Acurio’s restaurant group, the menu offers a glimpse into traditional and authentic Peruvian flavors. Their outdoor patio, situated among the docked boats, provides one of the most iconic views of the bay—only outshined by the colorful staff on hand to cater to your every whim. 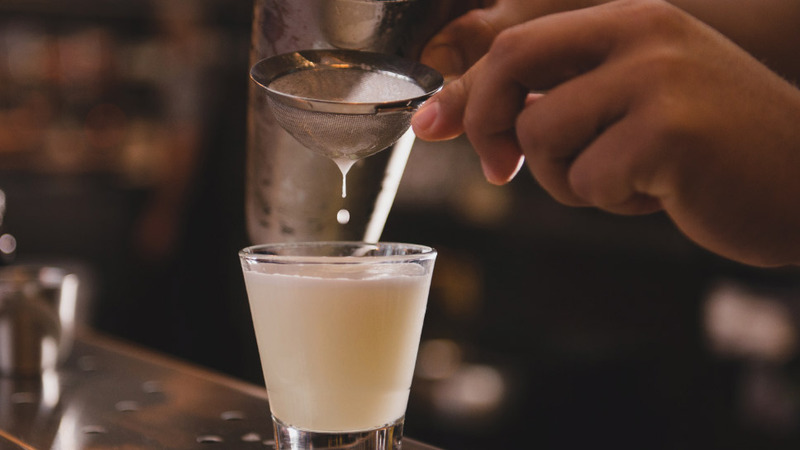 One cannot leave a visit to La Mar without sampling their signature Pisco Sour—made of pisco (a colorless brandy produced in the wine-making regions of Peru and Chile), lime juice, simple syrup, egg white, and angostura bitters. Absolute decadence. To close out a full day of sights, smells, and sounds true to the Bay Area, look no further than dinner at the Presidio Social Club. Nestled within San Francisco’s beautiful Presidio National Park—an oasis from the city—is the Presidio Social Club. Since opening in 2006, the restaurant is an inviting setting fit for an intimate dinner for two or a celebratory venue for large groups. Erected in 1903 as military barracks, this historical building has been repurposed into a modern eatery featuring contemporary twists on American staples and artfully crafted cocktails. The chef’s special fried chicken (Executive Chef Wesley Shaw’s Roasted Half Chicken with baby carrots, lemon, broccoli ciccio & natural jus, Macaroni and Cheese baked with herbed bread crumbs) with macaroni and cheese and in-house Barrel-Aged Negroni left us speechless. San Francisco is proving in spades—through its revitalized hotel venues, its dining scene, and its custom experiences—that what once was old can be new again.